A few weeks ago, Ryan Ozawa of Hawaii Blog fame noticed a few MVNP clients advertising on his favorite podcasts. That spurred his question of how and why our media department uses geo-targeting for national podcasts. Thanks Ryan, you just sparked our latest blog! The popularity of podcasting, with its diverse niche content and on-demand convenience, is undeniably on the rise. According to Nielsen Podcasts Insights 2017, 50% of homes are podcasts fans, creating a strong connection between podcasts audiences and purchase behavior. And now, with this growth and the technology that allows for geo-targeting, local companies can advertise within national podcasts to reach their desired consumers. Advertising through national podcasts sounds like a good idea for giant corporations and local business alike. But what good would it be to have First Insurance Company of Hawaii market to listeners in Michigan, when it doesn’t apply to them at all? 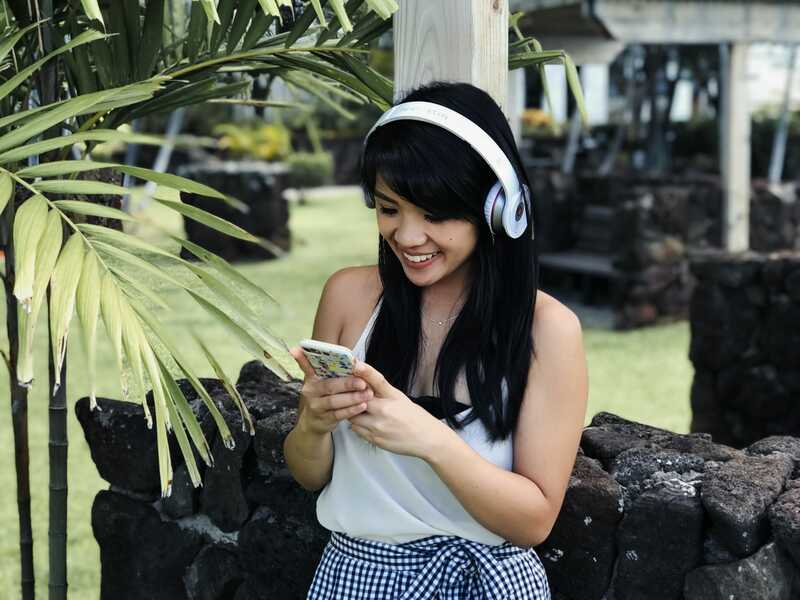 Lori Kimura, Media Director at MVNP, points out that with these innovations, local companies like First Insurance are now able pinpoint and target their message within national podcasts to listeners in a specific geographic location. Kimura also stresses that podcasts provide our clients with the ability to engage one-on-one with their target audience according to lifestyle and interests. What’s unique about podcast advertising is the amount of trust that consumers place upon the hosts. According to Nieman Lab, ads read by the podcast host make advertising feel seamless, thereby providing an uninterrupted listening experience. This was noted as early as 2015, in research done by the Columbia Journalism School, which suggests that listeners don’t mind podcast ads because they are naturally integrated into the show. They are read in the same style as the show, which also makes listeners more prone to listen to the ads, rather than skip right through them. Host-read ads feel more authentic and credible than if the ad was provided pre-recorded by the company itself. This is also where the quality of the podcast matters. When the show is trustworthy and credible, the ads feel the same way. Kimura recognizes the heightened ad recall and engagement associated with podcast advertising, while acknowledging that traditional channels—television and radio—still continue to play a vital role in providing the mass reach to consumers. That said, planners must take into account media multi-tasking consumers and the challenge to engage with them. As such, adding podcasting into the overall media mix allows the ability to reinforce an ad campaign’s messaging and ad recall. National Public Radio (NPR) is an important player in podcasting, and is currently considered the #1 podcast publisher in America. 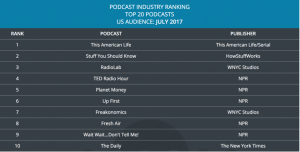 In their July industry rankings, Podtrac shows that NPR publishes 7 of the top 20 podcasts, and enjoys 9.2 million unique streams and downloads each month. It’s no surprise that advertisers are looking closely at these ad opportunities. According to surveys conducted by NPR, 76% of their podcast listeners develop a more positive opinion of a company when they discover that it supports NPR programming, while 59% of listeners pay more attention to ads integrated into NPR podcasts. Those are high percentages of recall, something that entices companies and agencies alike. In recognition of this, MVNP clients, First Hawaiian Bank and First Insurance Company of Hawaii, have added NPR podcasts into their overall media mix. Kimura describes how podcast advertising fits into MVNP’s strategy for media recommendations. Media directors and professionals in the field, like Kimura, are incredibly important for brands that plan on seeking out emerging media channels and advertising opportunities such as podcasts. With an ever-growing library of podcasts available, a business can rely on a media professional to pursue those shows that are aligned with their personal brand, which will ensure a strong sense of credibility and trust with their audience. Author/Intern Kate Uesugi attends George Washington University, Class of ‘19, and is pursuing a degree in International Business and Marketing, with a minor in Sustainability. She will be studying abroad in Barcelona this upcoming fall semester. She’s planning on traveling throughout Europe and eating as much paella as humanly possible. Special thanks to Lori Kimura for contributing to this post and sharing her expertise.